Kiowa Chief Stumbling Bear who signed the Medicine Lodge Treaty, 1867 founded the first permanent settlement of Plains tribes, on Canyon Creek, southwest of here. First government built houses for Indians were erected in the settlement 1877. From Apache, OK, Caddo County, take OK 19 west 11 miles to OK 58 turn left on to OK 58 south 6.8 miles. sign is on the left. 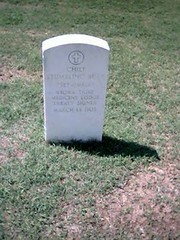 Grave marker is located: Chief Knoll, Fort Sill Cemetery, Fort Sill, OK. The Medicine Lodge Treaty was a treaty that the United States of America signed with the Kiowa, Comanche, Plains Apache, Cheyenne, and Arapaho at Medicine Lodge, Kansas in 1867. What is known as the Medicine Lodge Treaty actually consisted of three separate treaties. The first was signed October 21, 1867 by the Kiowa and Comanche tribes. The second, with the Kiowa-Apache, was signed the same day, while the Cheyenne and Arapaho signed the third on October 28. The United States federal government during this time repeatedly reduced the size of Indian reservations. The Medicine Lodge Treaty assigned reservations with the aforementioned tribes, bringing them in close contact with the Sioux, Shoshones, Bannocks, and Navajos, setting the scene for more conflict for dwindling resources.